This walk: 2013-6-27. Sourton Tors, paraglider, King Way, ice works, dolerite, triangulation pillar, Church of St. Thomas a Becket, Great Links Tor, boundary stone, apple crusher, stone circle, black sheep, Meldon Reservoir, Meldon Viaduct, Snipe fly, Branscombe's Loaf, Shelstone Tor, wheatears, Black-a-Tor Copse NNR, Greep's Quarry, Vellake. Other walks in this area - 25 March 2009, 1 February 2012 and 5 June 2013. Two posts marking the King Way, this was a fast mail delivery route for several hundred years, using high, dry ground from the Exeter direction towards the west, with paraglider over Sourton Tors: this is not a granite tor but a dolerite formation (often found in dykes and sills): it is a darker and finer grained igneous (from hot, molten) rock formed at the rim of the granite in this area..
Man-made reservoirs, mostly lined with brick, were made along the contours to collect water that would freeze in the winter. Ice was made here 1875-1885. James Henderson, a civil engineer, saw an opportunity to supply ice for transporting fresh produce, such as fish, to markets as the railways were built. Ice machines did not exist at that time. There was a spring nearby to supply clean water and access to the railways via nearby Bridestowe station. The north-east facing slope was ideal . "On a wing and a prayer", approaching the Church of St. Thomas a Becket, Sourton. 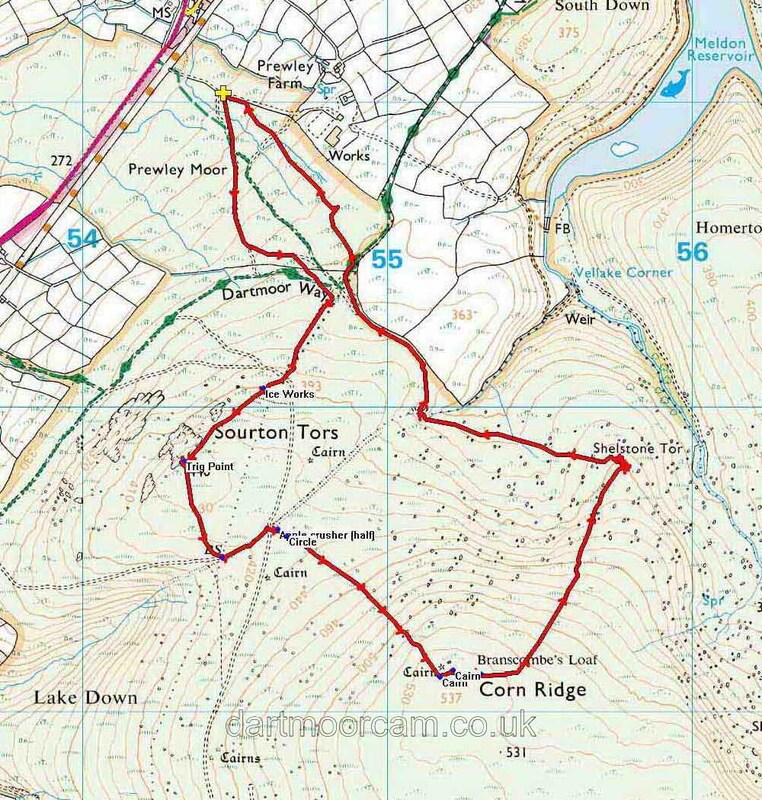 Great Links Tor, SX 5511 8675, elevation 589 metres (1922 feet). Unusual landcape feature, bumpy ground: is it underlying rocks (too regular? ), frost "heave"? or vegtational, grass clumps etc? Probably not moles! Okehampton, looking like "9�". This marked as "BS" on the map and is at the head of Deep Valley aka Withecombe Bottom. The stone is also known as Spring Rock. Dave Brewer (2002) Dartmoor Boundary Markers, Halsgrove, p. 174 states: "North of the King Wall, and on the ancient King Way, south-west of Sourton Tors, there is another boundstone inscribed "90/B" i.e. "OP/B" for Okehampton and Bridestowe at SC 5449 8970 on the outer bounds of that common and situated between substantial old boundary banks, known as Iron Gates .........."
View with Sourton Tors behind. 32-metre diameter stone circle, SX 54672 89578. There are 18 stones, 5.5 metres apart, all flat but mostly with one edge still embedded in the ground. . Believed Snipe fly (Rhagio species - there are several) seen in June over several years now - they like me! Branscombe's Loaf (a different link). Meldon Reservoir and Viaduct, with cotton grass. Another view of the loaf. Shelstone Tor. Click on the image to see a larger version. Pair of Wheatears (female, left and male, right) with striking white rumps when they flew. Greep's Quarry, at SX 551 899, that yielded slatey border rock that was used in Sourton village, in the Victorian vicarage and the Wesleyan chapel. The stone was removed by cart track to the village. Looking down Vellake, a quite dramatic reentrant valley. One of Snipe flies again! As I said, they like me. Complete with a hole through. Elevation Profile, starting at the left. Copyright © 2005, Memory-Map Europe, with permission. This walk was reached via the main A386 Tavistock-Okehampton road, turning off at the brown "Granite Way" sign shortly after leaving Sourton while traveling towards Okehampton. Parking is at the yellow cross symbol on the map. Distance - 6.55 km / 4.07 miles.